***I am a member of the Collective Bias® Social Fabric® Community. This shop has been compensated as part of a social shopper insights study for Collective Bias® and KimberlyClark® #cbias #SocialFabric All images and altered screenschots are original content copyrighted to Momma Told Me Blog, 2013. Momma Told Me: Frugal can be fun! As a child, few things (barring a teenager in a sweaty mouse costume at an arcade) were more exciting than a chance to go to the movies. I recall the mini strip mall in our little Southern California home town had one of the largest arcades I've, still, ever seen; complete with a little snow cone booth outside. This particular strip mall was the mecha of all things childlike and whimsical, for it didn't stop there. All the way on the far East end was a KB Toy Store, and smack daub on the middle was the Edwards 8 Cineplex. Naturally, even though I knew I was already being treated to the special occasion of a movie, I never let Momma leave without visiting the entire array of entertainment attractions. As a child money meant little to me. I always assumed Momma received an allowance magically deposited into her piggy bank each month, much like mine. I never stopped to consider how all the small frugal things she did (like pop our popcorn at home and smuggle it into the theater in Ziploc baggies), made all the awesome treats possible. Today I'm very much like Momma, when it comes to the household budget and stocking up on essentials at great prices. In addition to frequenting the wholesale club once a month, I am constantly clipping coupons and taking notes for upcoming sales. We shop at Walmart often for their everyday low prices that promise to match or beat local competitors; and of course, for their accommodating coupon policy. Not only can I buy value packages of my family's favorite brands and products, but I can extend the savings with exclusive promotions and paper coupons. Just the other weekend I opened one of our households 3 copies of the Sunday paper to discover the above beauty in a Smartsource insert. Two specially marked Scott paper product value packs now feature an exclusive $4 Vudu movie credit for a limited time. We already stock up on our favorite Scott Shared Values products regularly, so I knew I wasn't going to miss my chance to snag these limited quantity packages. Our family goes through an astounding amount of Paper Towels and Toilet Tissue. So much so, I constantly find myself turning into the P.T. (paper towel) Grinch, and marching around the house enforcing strict tearing regulations. It physically pains me to see a half torn paper towel laying crumpled on the kitchen counter, or a forgotten roll of toilet paper with several sheets left, in the bathroom waste basket. 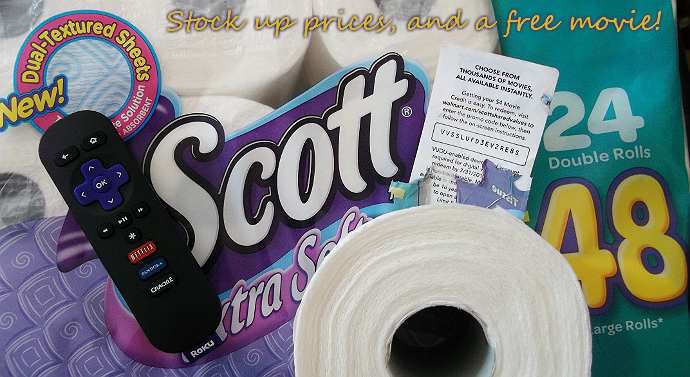 So, when I saw that I could buy 6 mega rolls of Scott Choose-A-Sheet Towels for just under $6 and score a $4 Vudu movie streaming credit I was in frugal heaven. Not only do these paper towels offer the added value of being tough and extra absorbent, but the simple tear-a-sheet lets us select a size to clean up any mess without waste. I was so moved by this amazing deal I actually told Sabrina (10) we could use paper towels for something other than cleaning! Nearly everyone recalls paper tube crafts from their Elementary days, but have you ever made crafts out of the paper towels themselves? 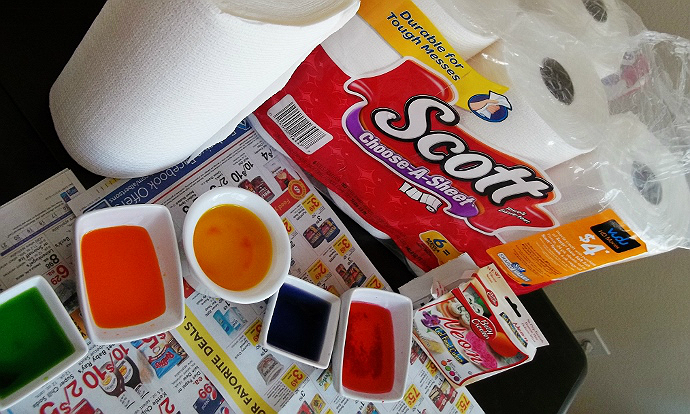 Naturally this wouldn't work with toilet tissue, but the thick and durable textured Scott Choose-A-Sheet towels offer variety in size and absorbancy perfect for some home dyed paper flowers and butterflies. All you need is a well covered workspace, some food safe dye, plenty of paper towels, pipe cleaners, and a designated 'drying zone.' 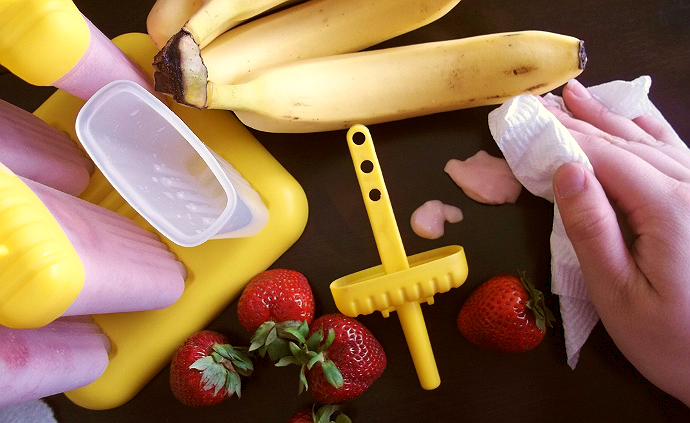 This craft is a hit with all ages; who doesn't love playing with colors- and food dye isn't just for Easter Eggs! We had a blast folding the paper towels into various shapes then carefully, and quickly, dipping corners and edges into the various colors. When we were done I placed the sheets into our dehydrator (though they will air dry overnight just as well). Making 'flowers' is as simple as crumpling, rolling, or folding the dried sheets and wrapping a pipe cleaner around the base. These were a big hit at Sabrina's school the next day when she handed them out to teachers and staff! Following our afternoon of crafts I decided it was time for a little break. 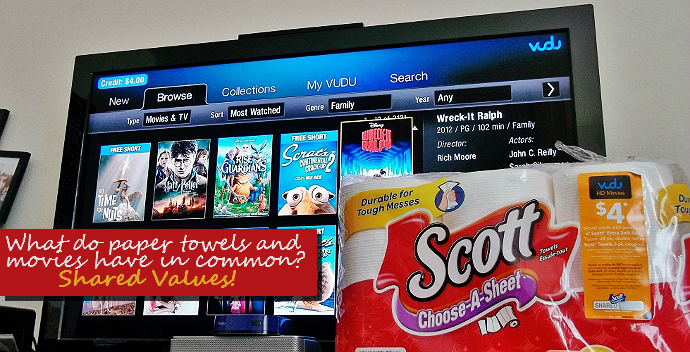 We carefully peeled the $4 Vudu code sticker off the bundle of 24 Double Roll Extra Soft Scott bath tissue, and put the remaining groceries away. In our home there is a designated spot for overflow paper products; I have a fear of running out of toilet paper or paper towels and am sure to stay fully stocked. Sometimes, however, a deal is too good to pass up, and you'll open a hallway cupboard to find toilet paper tumbling down at you! In any case, with our Scott haul put away we whipped up some quick and healthy homemade frozen yogurt pops, and hit the couch for a double feature on Scott. We don't subscribe to paid cable television in our home, only high speed internet, so digital streaming is a way of life for us. We were no stranger to the Vudu digital media application on our Roku streamer. We simply logged onto the #ScottValues Walmart portal and entered our code to apply the $4 credit to our Vudu account. In no time we were enjoying the newly released Wreck It Ralph with dripping popsicles, and plenty of paper towels near-by. As amazing as the limited time $4 Vudu Scott promotion is, there are plenty of more values to be found at the Scott Shared Values website. This entirely purchase free program is open to all US residents and provides immediate value from a collection of close brand partners. I've been with Scott Shared Values since it's kick off late last year and am constantly impressed by the quality of savings and deals that can be found. Currently members can enjoy a free roll of new Scott Extra Soft bath tissue, a one month trial of HuluPlus streaming, a special Weber Grill Set deal (just in time for Father's Day), and a free photo print from ClickPhotos.com. Not to long ago we enjoyed a family pass to a local entertainment venue, and a friend of mine took advantage of their NASCAR ticket savings. I'm always sure to log into my Scott Shared Values account each month to see what's new! To sum it all up, Momma taught me to be frugal; but still have fun. I may stomp through the halls writing imaginary tickets for paper product abuse, but I still know a great opportunity for family fun when I see one. 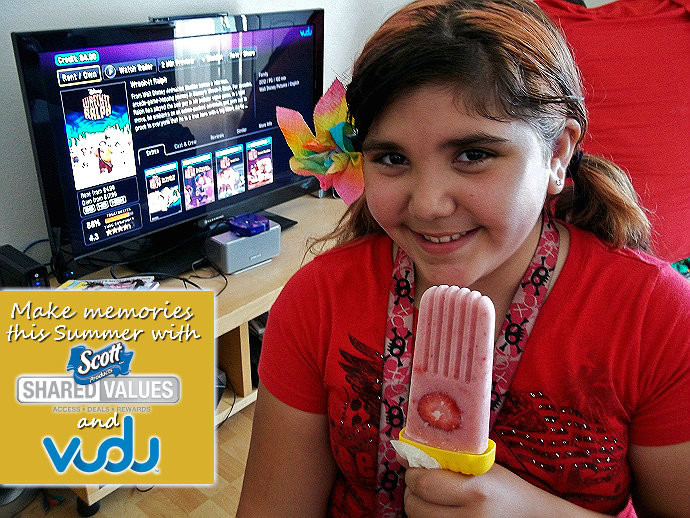 Just in time for lazy Summer afternoons the $4 Vudu credit on select #ScottValues products will keep the kiddos happy and Momma's checkbook in tact. Stock up now to take advantage of these great prices at Walmart, and be sure to join the Scott Shared Values program to continue the savings all year round. Follow us along on our Walmart visit and get a sneak peek behind the scenes in our Google+ album. What Daughter Says: Don't be a Summertime Grinch, enjoy the hottest movies for FREE while stocking up on your favorite #ScottValues products. I've NEVER seen paper towels used like that before! LOVE the craft project!!! Very clever and hey, self-cleaning LOL! I'll do anything to watch free movies ;) Plus there are so many fun things you can do with Paper Towels! I love those Scotts Butterfly and Rose Crafts! So cute! I love the Scotts paper towels! We use them all the time. I love the select a size options! That's s o unique! I wanna come hang with you! That paper towel flower is cute. I sometimes turn into the paper towel Grinch myself when my family gets too wasteful. 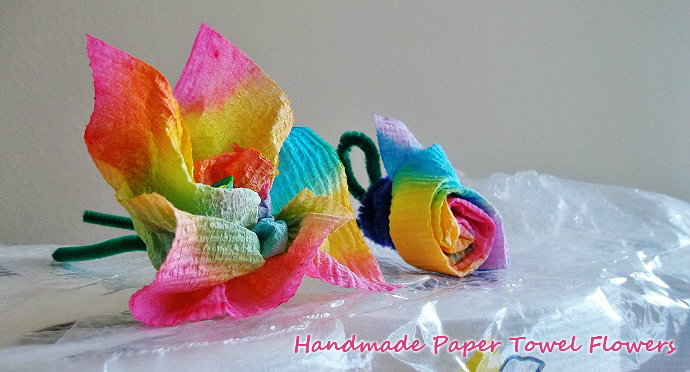 Omg the paper towel flower looks so cute & fun, never tried crafts using paper towels before! You should totally do a tutorial! I actually use the same brand, I love them. Haha, paper towel grinch, that's so describes me too! That is so cute! I love the paper towel flower! 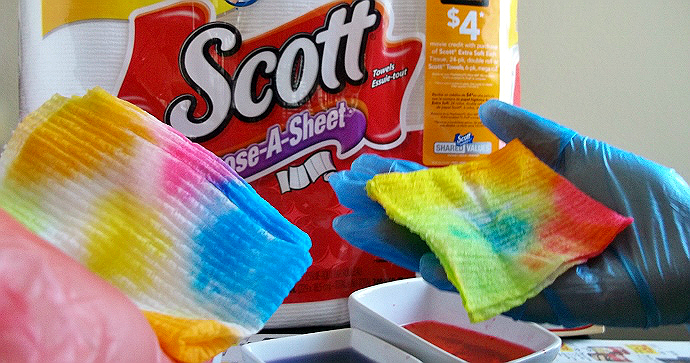 I remember my kids making those paper towel tie dyes in preschool. That is a great summer project for me to pull out this year too. Thanks for sharing. Those paper towel ribbons are awesome!! I want to try that too! That is an awesome craft with paper towels. And, I love the bonus of a free movie for buying a staple item. LOVE LOVE LOVE your paper towel crafts!! I simply cannot believe you can make that with Scott Paper towels. I think they would be wild over this craft. I love the cute crafts. I also like the choose your size paper towels - so economical! Oh my gosh, that is sooo cute! I can't believe how creative that is! I love those flowers! Pinning this! I love the paper towel flowers. What a great idea. We made a float once for a homecoming parade with paper towel and toilet paper flowers! It was amazing! These are such pretty things to make with of all things paper towels Scott of course.Who would have thought. Easy for the kids to make . This is first for me for paper towels. Great fun for kids too! 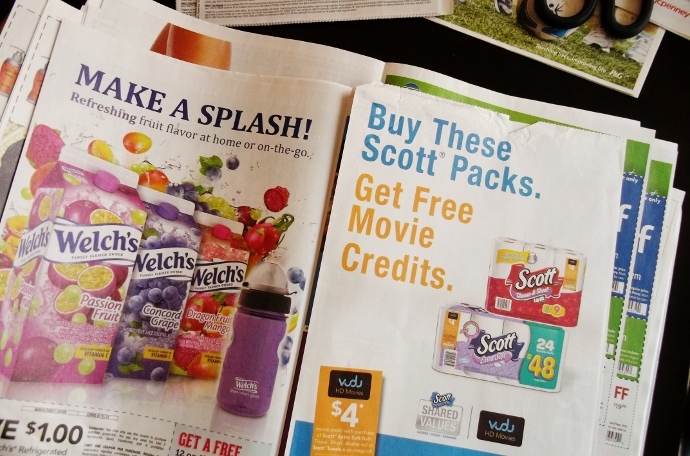 Scott has products with great value - including free movies! 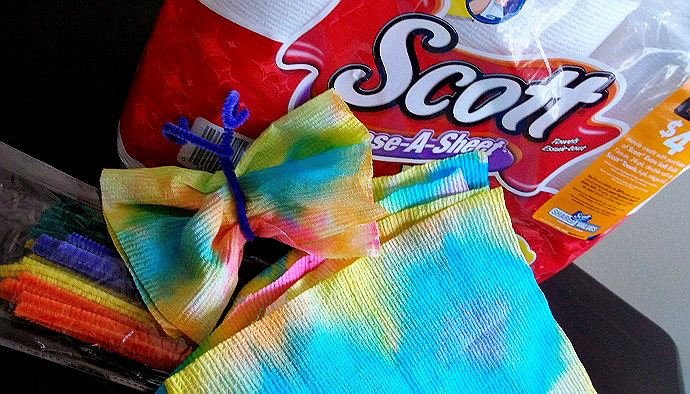 How fun and colorful - turning regular papertowels into unique pretty pinwheel flowers! That is such a cool and creative way to use paper towels. Love it! The flower is so cute, what a great idea!! I totally identify with the 'paper towel grinch' scenario! That was me when my kids were little! But the flower idea is a cute craft for kids! I love the way you used the paper towels, especially the flower. We use Scott but don't have digital streaming so can't use the Vudu coupon. Looks like you all had a blast! Love the colorful craft you made together.